What is a WIP you ask? A work in progress! I am stating this first, because honest to God I only found out what this meant about a month ago! 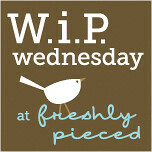 I kept seeing WIP everywhere and thought, "What in the world does that stand for!" and then I found out and felt dumb, I honestly can not keep up with the abbreviation/texting stuff at all. Oh well, I guess that is what happens when you get older, and you know at my ripe old age of 30, things are really going downhill. HaHa! Back to my point....This is my first WIP Wednesday, and basically I am going to share with you, all of the projects that I have going on right now, and hopefully each week I can cross something off the list (or maybe even a few things!) Since this is my first week participating, I will be listing everything I have sitting around that I need to work on and finish! This list is kinda long! Cutting into the Stack of Home Dec Fabric I just received to make Mary Rose Clutches. Nice work Marci! You've got me motivated to head home and work on the sewing room. LOL Love your "stats"! They look just like mine ;-). Love all of the fabric you're working on too! LOL, I forget that not everybody knows what all these acronyms mean. : ) Well, I'm glad you know now! You've got some great projects on your list. I'd be happy to take one of those AMH velvet scarves off your hands if you'd like to mark that off your list. : ) Oops, there's another acronym! Gah! I don't even want to admit how many WIPs I have in my closet upstairs right now that have been put on "neverending hold" because of working on the house.